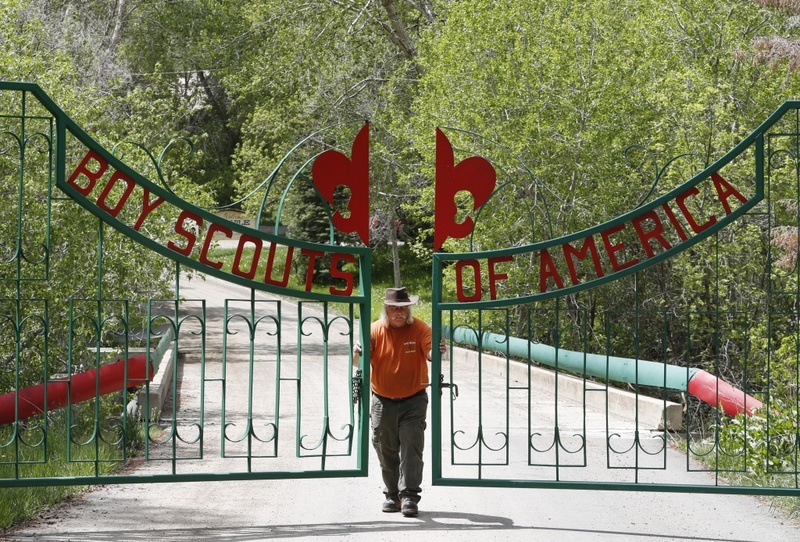 Mark Veteto, Camp Ranger for the Maple Dell Scout Camp, owned by the Utah National Park Council of the Boy Scouts of America, closes the front gate for the day on May 9, 2018 outside Payson, Utah. In a joint statement on Tuesday, The Church of Jesus Christ of Latter-Day Saints and the Boy Scouts of America announced their split, ending a century-old tie. Reasons for the break include satisfying the church’s international membership and the desire to create “a uniform youth leadership and development program that serves its members globally." The church also expressed concerns with letting LGBTQ members and leaders into the scouts. As the Washington Post reports, the announcement comes only days after the BSA announced it’s name change to Scouts BSA, as part of its decision to let girls join the group. The separation has been officially set for 2019, when the LDS community plans to transition its 420,000 current scouts into a new youth organization. So how will this affect the BSA? And what could this new LDS youth program look like? Will the Boy Scouts of America open up its ranks to the LGBT community?